A cute Polar Bear kneels on the blanket of ice and snow on the landscape of the Churchill Wildlife Management Area in Churchill, Manitoba. For a large animal, it is amazing how flexible a Polar Bear can be as this one sits in a kneeling position on the snow covered tundra in the Churchill Wildlife Management Area in Churchill, Manitoba. With his big dark eyes looking at us, he seems very calm and relaxed in his cute kneeling spot. As this Polar Bear slowly starts to get up, his front legs hold most of the weight as his back legs still remain curled up underneath. 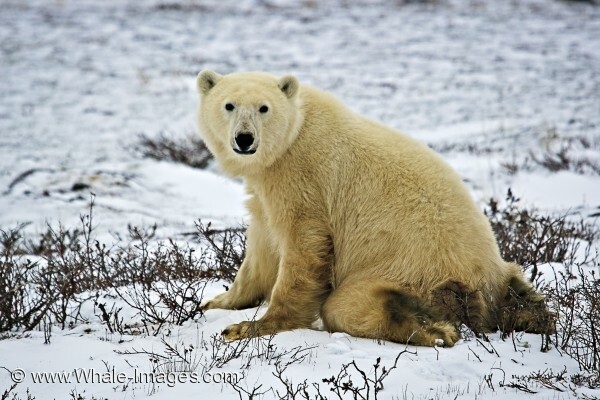 An adult male Polar Bear can weigh between 780 and 1500 pounds with a female being about half the size. Either way it is a lot of weight to support, but a Polar Bear has no problem with it as they are the largest predator which lives on land. This cute Polar Bear looks as if he is in an awkward position, but he can easily get up and be ready for any type of action within seconds. The tundra landscape in Churchill, Manitoba has just begun to get its winter coat, which will make life for a Polar Bear much easier as his meals will become plentiful after the pack ice has formed in the Hudson Bay. Resting is still very much needed for a Polar Bear, but his main concern will be capturing Ringed seals while atop the ice floes. There are many times when a Polar Bear uses his smell to locate a breathing hole where a seal will surface and the Polar Bear will crouch there until one comes up for air. When the seal surfaces, the bear will reach into the water and drag the seal out onto the surface where it can easily crush its skull. This cute position in which this Polar Bear is in, is commonly used in hunting and relaxing. The ice around the Hudson Bay will melt completely during the summer months which forces the Polar Bears to head inland and wait for the area around Churchill, Manitoba to freeze up again. Polar Bears which are fat and well fed will rarely attack a human unless a situation is out of the ordinary, but a Polar Bear who has not eaten for some time, have been known to attack humans as their behavior can be all over the board. While bear watching in the Churchill Wildlife Management Area in Manitoba, Canada, it is best for all visitors to stay in their vehicles or aboard the tundra buggies for the safety of both the animals and themselves. Even a young Polar Bear, can look and appear very cute, but one never knows what type of situation could change its mood.